Announcement – LDA and trakMD’s Official Partnership! 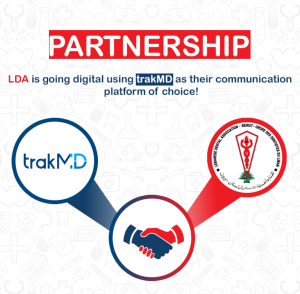 trakMD and the Lebanese Dental Association (LDA) are proud to announce their official partnership! The aim of this partnership is to provide all registered LDA dentists with an improved and seamless communication using trakMD’s digital platform. As of April 23rd 2019, all LDA’s communication material will be sent and received on trakMD’s app. Posted on April 19, 2019 Categories Blogs, NewsTags dentists_Lebanon, LDA, Lebanese Dental Association, trakMD_LDALeave a comment on Announcement – LDA and trakMD’s Official Partnership! Lancée en octobre dernier, TrakMD est une plate-forme qui permet de trouver un médecin et prendre un rendez-vous instantanément et partout au Liban. Depuis un ordinateur ou via l’application mobile, il suffit de se connecter, d’entrer le type de spécialiste et la localité recherchés. TrakMD propose ensuiteune liste de professionnels correspondantau profil souhaité. Il n’y a plus qu’à les contacter. Les utilisateurs peuvent aussi se créer un dossier médical numérique ou demander à recevoir des notifications de rappel – par exemple pour des examens réguliers ou les vaccins des enfants. Totalement gratuit, TrakMD est en faitun produit d’appel qui permet de vendre des services numériques avancés auxprofessionnels de la santé. TrakMD propose en effet aux médecins et centres médicaux de prendre en charge leur stratégie digitale, que ce soit l’optimisation de la prise de rendez-vous, de la facturation, l’analyse de données des examens, ou la mise en réseau des machines médicales. Son fondateur, Ibrahim Fakih, est un ancien infirmier spécialisé en nouvelles technologies. Pour créerTrakMD, il s’est inspiré de start-up similaires en France et aux États-Unis. Après un investissement sur fonds propres de plus de 200000 dollars, etdeux ans de développement, TrakMD revendique aujourd’hui environ 500 médecins et plus de 10000 téléchargements. La start-up compte depuis quelques mois un nouvel investisseur, lui aussi issu du secteur médical, et cherche à lever davantage de fonds. « L’idée à long terme est d’améliorer l’accès aux soins médicaux, notamment dans les régions reculées et pour les populations marginalisées comme les réfugiés », dit Ibrahim Fakih. When it comes to health, Lebanon is one of the leading countries in the Arab world in terms of the quality of healthcare provided and in testing new medical technologies. The country now has the opportunity to lead the way in entrepreneurship via healthcare startups. Executive spoke with entrepreneurs in this field to see what challenges they faced and what obstacles still need to be overcome to find success as a healthcare startup. According to a 2016 Wamda Capital’s report on health startups, MENA is growing its first generation of health entrepreneurs, which means that the region is witnessing the first business and economic wave of an industry that is likely to expand and unveil a vast range of entrepreneurial opportunities. Meanwhile, worldwide information technology solutions for healthcare are entering their third wave. As consulting firm McKinsey & Company pointed out in a 2014 paper on the digital future of healthcare, the first two waves of IT brought computation of data and statistics to healthcare institutions in the 1950s and helped with integrating processes among healthcare organizations in the 1970s. Compared with these advancements, the third wave of digitization is seen as having incomparably greater implications, from robotic surgery and remote diagnosis to mobile healthcare via digital apps. Given the huge social and economic implications of the full digitization of healthcare and wellness, any entrepreneurial ecosystem should be priming itself to nurture startups related to healthcare. This applies in Lebanon as much as anywhere, but local healthcare startups who spoke to Executive report experiencing the same frustrations felt by other startups in the Lebanese ecosystem, such as the difficulty of attracting funding and the lack of local talent. Among local startups, diabetes digital monitor Weglo is still in its first development stage. Spike, a software application that helps and guides diabetes patients with their everyday treatments, and TrakMd, an online platform that helps patients find, book, and review doctors around Lebanon, have already progressed beyond the launch phase and are currently operating in a full commercial form. While the entrepreneurs that spoke to Executive cite similar difficulties to those encountered by emerging healthcare startups worldwide, they also raised issues unique to the Lebanese market, and opined that the economic situation in Lebanon negatively affects startups due to the dearth of appropriate resources and professionals within the field. Lack of public reach—becoming recognized and showcasing services to the general public—can be a challenging initial hurdle for startups to conquer. Typically, online outreach has proven to be the most effective method for startup brand advertising. Search Engine Optimization (SEO)—the process of maximizing visitors to a website by ensuring it appears high in the list of search engine results—has reportedly been very effective for some startups, such as Spike, which is now in the process of planning a global app launch. Although SEO has proven effective at increasing a brand’s exposure, others in Lebanon still struggle to make themselves known, which in the long run could affect the profitability and net worth of the organization. Another major issue is that of funding. While this barrier is faced by startups in all sectors, healthcare startups require relatively large amounts of funding in order to succeed. All the entrepreneurs interviewed by Executive agreed that obtaining funds in Lebanon is one of the most difficult tasks, due mainly to the low risk mentality of investors. Spike reports obtaining an estimated $150,000 from different venture capital (VC) funds such as ZOUK, Kafalat, SeatBoost, and MIT, while Weglo and TrakMD say that the VC road was more difficult for them and instead they had to self-fund their ventures. “I started self-funding, first using my money to pay for people and acquiring parts for prototyping,” says Abed el-Rahman el-Kaderi, co-founder of Weglo. Both Welgo and TrakMD say that the lack of local CV funding resulted in delays in developing their concepts and presenting their services. In their 2016 report, Wamda Capital notes that health startups in MENA region often rely on more informal sources of financing—personal funds, family money, friends’ money, and grants—over any other funding sources, especially for early-stage capital. After clearing development and funding hurdles, healthcare startups still face challenges related to their legal status within the wider healthcare sector, its potential client pool, and ensuring user privacy. “Legal credibility is a big challenge for startups since formal institutions are set within the traditional healthcare infrastructure,” according to Kevin Shoucair, business support manager at local accelerator Speed. Having a large portion of the population in poverty also makes it more difficult for startups to target clients with the means to use their products and realize their full potential. “Health startups also have a great cost coming from establishing security systems, which will ensure the user’s privacy and access,” Shoucair adds. Local entrepreneurs also cite positive aspects of the current healthcare startup ecosystem, including low competition and non-saturation of the market. According to Alameh and Kaderi, since the healthcare startup market in Lebanon is still in its early stages, this makes it easier for new companies to break out and become noticed. “The only advantage we have in Lebanon is that it is easier for us to get recognized in the sector, as there are not a lot of competitors,” Kaderi argues. While the future is unpredictable in a country as volatile as Lebanon, each of the healthcare startups Executive interviewed agreed that much depends on the approach adopted by the startup. Funding and marketing are not enough to guarantee the success of a healthcare startup: Ethics also play a major role. In this regard, mistakes cannot be made, as their effects will impact directly on the wellbeing of consumers. As a result, the research done into emerging healthcare startups needs to be extremely accurate and undertaken by experts in the field to avoid harmful consequences for the health of citizens. To better understand how investors and funds make their decisions, Executive also spoke with funds and accelerators that previously invested in the healthcare ecosystem. There is clear growth in the Lebanese startup market, with the sector thriving ever since Banque Du Liban launched Circular 331 in 2014, which provides support for emerging startups, private equity firms, and accelerators. To further expand the viability of the startup ecosystem, the Lebanese Venture Capital and Private Equity Association (LVCPEA) was launched at the start of 2018 with around $360 million in funding to dole out. Including major players like Berytech, Leap Ventures, and Middle East Venture Partners (MEVP), the core mission of the association is to help investors effectively engage in the creation of information and communication technology in Lebanon. Based on the portfolio descriptions of Lebanese VC firms, on average, two health startups are invested in per fund, with most being software-based startups such as Spike, the application for diabetes assistance, and AlTibbi, a platform for healthcare-related knowledge. There is not a specific budget set for healthcare startups, which are sometimes included as a tech investment or software investment. With most VCs prefering to invest in software-based startups, it is a real challenge for hardware-based startups to grow in Lebanon, especially if they require R&D investment. “There is a low to zero R&D environment, so there’s little homegrown innovation taking place which can be spun off into startups,” says Fadi Bizri, partner at B&Y venture partners, a VC fund for technology startups in the MENA region. Given the great human capital residing in Lebanon, the potential for the healthcare sector is promising. According to research carried out by MEVP, an estimated $450 million per year is spent on general doctor consultations in the MENA region. Currently, the private healthcare market size in the GCC is around $62 billion, and is estimated to grow 8.7 percent per year to reach $94 billion in 2021, according to MENA Research Partners (MRP), a leading research company in the region. There are indeed, big investment opportunities in the entrepreneurial health sector, given the mentality shift from curative to preventive healthcare among an increasingly health conscious and tech savvy population. “With current infrastructure adopting new innovative technological trends, healthcare startups will see greater adoption in Lebanon. [These technologies] will also be more accepted by the government, regulatory bodies, and eventually the country’s biggest hospitals,” says Walid Mansour, a managing partner at MEVP. The challenges and drawbacks facing healthcare startups are severe, with the most common and recurrent challenge being funding, especially for non-software based startups that require heavy capital in order to build their prototypes. However, low competition works in the sector’s favor, allowing emerging startups to grow and be noticed in the Lebanese market. The future of the sector depends on how entrepreneurs, funds, the government, and the market act and react—in particular to address the challenges detailed above. In the meantime, Lebanon should support and embrace the development of a healthcare entrepreneurial ecosystem and work toward improving it for the sake of a healthy economy and a healthy populace. trakMD منصة رقمية ثورية تم إنشاؤها لإعطاءتجربة مُرضية للرعاية الصحية للمرضى من خلال تسهيل الوصول إلى الأطباء وتعزيز التفاعل بين الأطباء والمرضى. باستخدام منصة trakMD، يستطيع المرضى البحث عن الأطباء حسب التخصّص أو الموقع أو توافر المواعيد، ومعايير بحث أخرى، ثمّ حجز الموعد وكل ذلك في نقرة زر. يشدّد إبراهيم فقيه، الرئيس التنفيذي ومؤسس شركة trakMD على أنّ: “المرضى أولاً، هذا هو هدفنا الأساسي البارز من خلال التزامنا الجماعي بالجودة والنزاهة والابتكار المستمر في أعمالنا”. وأضاف: “نحن نسعى جاهدين للالتزام بإطار عمل صادق وشفاف، مع الحرص الشديد على احتياجات الجهات الفاعلة الرئيسية في قطاع الرعاية الصحية”. الميزة الكبرى التي وفرتها trakMD هي أنها مجانية بالكامل للمرضى. يمكن الولوج الى المنصّة من أيّ مكان و في أي وقت من خلال الهواتف الذكيّة أو الحواسيب الشخصيّة. فبنقرة زر واحدة، سيتمكن المرضى من الاطلاع على الملف الشخصي للطبيب و آراء المرضى الآخرين الأمر الذي يساعدهم على الاختيار. trakMD ترسل تلقائيا تذكيرا بالمواعيد عبر رسالة نصّية للمرضى لتضمن عدم تفويتهم أيّ موعد بسبب انشغالاتهم اليوميّة. BEIRUT: As a nurse, Ibrahim Fakih knew that the spike in blood pressure his father was experiencing required swift medical attention. He frantically called the treating physician but hit the answering machine repeatedly. Telephone calls to practitioners recommended by acquaintances eventually led to an appointment, but only two weeks later. “In Lebanon we suffer from a lack of [timely] access to the healthcare system,” Fakih said. More than a year later, he and his business partner Hussain Issa took inspiration from the experience and self-funded a project that intends to provide some fixes to the system. TrakMD, a digital platform designed to connect patients and doctors, enables users to customize their search in order to identify the right practitioner according to a set of criteria, including the field of expertise, geographic location, availability and gender. Appointments can be made online at the touch of a button, and a reminder is received by the user by SMS or email prior to the visit. Once the visit is over, doctors can access the patient’s digital medical record online and upload the results of check-ups and tests. At the same time, the patient is able to benefit from the personal medical record that can be shared with any number of doctors. Fakih, who also has a background in health-care IT and who automatized the systems of a number of health organizations prior developing TrakMD, is persuaded that the platform will become mainstream. “The world is moving toward digitalization and it’s time for Lebanon to move ahead and be part of the global digital [revolution],” Fakih told The Daily Star at Beirut’s Berytech center, where the startup is located. Issa, the business development manager at TrakMD, also shares Fakih’s optimism. According to Issa, the platform can potentially be used worldwide provided doctors and patients register in the system. “It can work without even having to contact us directly, the application can just be downloaded, there [are no obstacles],” he said. Similarly, Lebanese people living abroad can download the app and book their appointments in Lebanon online to avoid phone charges. 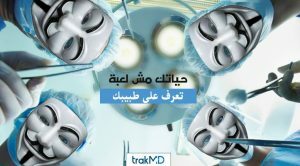 Less than two months since its launch, TrakMD already has some 4,500 users and 400 registered doctors. The practitioners’ index book, however, includes the numbers and addresses of all doctors registered with syndicates in Lebanon. “A doctor can be listed for free or he can choose to register to access our services,” Issa explained. 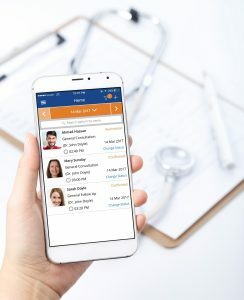 By registering for a fee that ranges between $30 and $90 per month, practitioners can activate online bookings, digitize their patient’s medical record and retrieve that information at any time, on any device. Once a visit is completed, users can also share their experience with other users by leaving a review of the doctor. Endocrinologist Youssef Rachidi also shares the same hope. “People don’t always [have a clear picture of who] the best doctors are,” Rachidi said, adding that he found that the bulk of work is concentrated in the hands of a few well-known practitioners. TrakMD, he said, will take a few years to fully reach its potential but it will eventually help doctors achieve more visibility in Lebanon’s bustling medical market. What Rachidi also appreciated about the platform is the fact that TrakMD is offering its own messaging service. “I am not happy when a client calls me or messages me on Whatsapp,” Rachidi said bluntly, adding that he perceives this as an intrusion in his personal life. TrakMD’s Issa said the feature was expressly requested by a number of doctors they interviewed when developing the system. “With Whatsapp, doctors cannot avoid patients because they appear online. [With TracMD], patients cannot see if the doctor has seen the message or not,” he said. Rachidi also noted that, at times, patients send him medical information on Whatsapp which he cannot save or put into context by reviewing the patient’s medical history. With TrakMD, however, he can save this information in their personal folder and review the medical history from his mobile device. According to TrakMD’s funders, the platform can also be modified to include new features that fit its mission. Recently, the “blood module” was designed and installed in collaboration with the Lebanese Red Cross and other health providers. Push notifications can be switched off, but users are still able to access the dedicated page and respond to one of the calls for blood whenever they are willing to. “The blood module was the latest addition – it fits the humanitarian scope of [TrakMD],” Issa said. As the team works toward expanding its user base, the developers predict the platform will evolve and change, adapting itself to new needs as they arise. A version of this article appeared in the print edition of The Daily Star on January 03, 2018, on page 3.